This is the new Poland Nike Home Kit which will be used during the 2018 World Cup. At base, the eagle is reflected in the kit design by a diagonal chest pattern on the jersey. Rendered in white and platinum grey on the home kit, the graphic represents the pride of the eagle cutting through the competition. On this basis, the eagle theme is implemented in the design of the Jersey as a diagonal line pattern with a sense of speed and vitality on the chest. The home shirt is composed of two colors of white and white gold, and the stadium shirt is a combination of two different red tones, showing the Polish people’s strong national pride and the courage to accept the challenge. 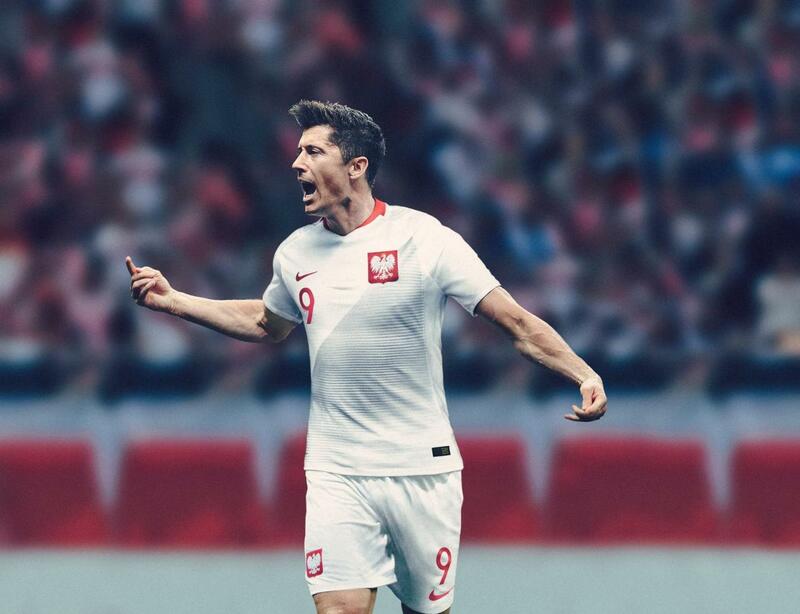 This is the new Poland Nike Away Kit which will be used during the 2018 World Cup. At base, the eagle is reflected in the kit design by a diagonal chest pattern on the jersey. Rendered in two shades of vibrant red on the away shirt, the graphic represents the pride of the eagle cutting through the competition.